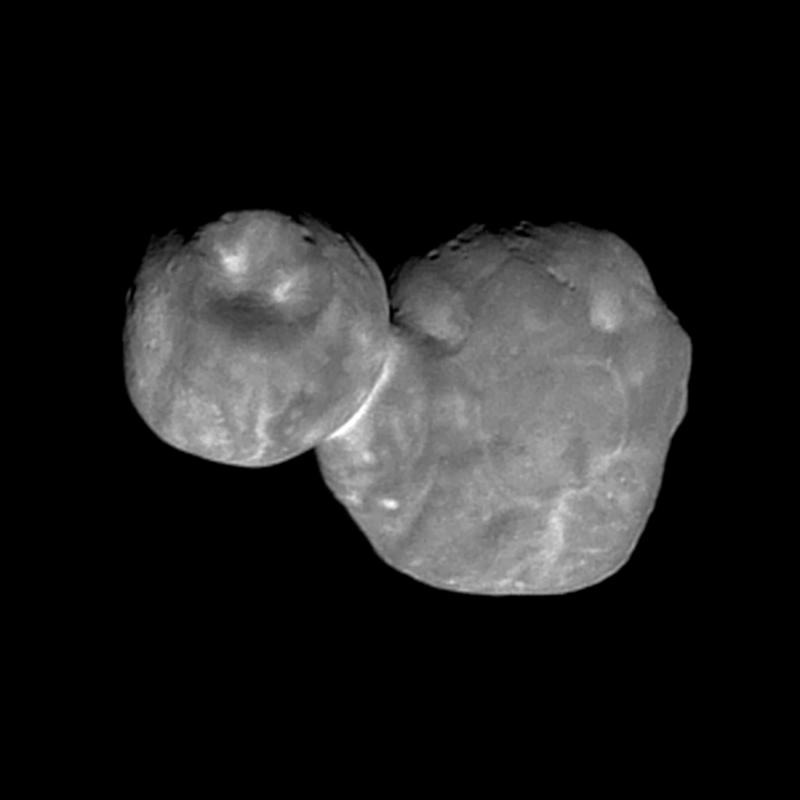 Obtained with the wide-angle Multicolor Visible Imaging Camera (MVIC) component of New Horizons' Ralph instrument, this image of the Kuiper Belt object nicknamed Ultima Thule was taken when the KBO was 4,200 miles (6,700 kilometers) from the NASA spacecraft, at 05:26 UT (12:26 a.m. EST) on Jan. 1, 2019 - just seven minutes before closest approach. The oblique lighting reveals topographic details along the day/night boundary, or terminator, near the top. These details include numerous small pits up to about 0.4 miles (0.7 kilometers) in diameter. The large circular feature, about 4 miles (7 kilometers) across, on the smaller of the two lobes, also appears to be a deep depression. Not clear is whether these pits are impact craters or features resulting from other processes, such as "collapse pits" or venting of volatile materials over the ages. Both lobes also show many intriguing light and dark patterns of unknown origin, which may reveal clues about how this body was assembled during the formation of the solar system. One of the most striking of these is the bright "collar" separating the two lobes.